The captain spoke to Lifeline. The captain of the El Hiblu 1, which docked in Malta Thursday, has claimed that Maltese authorities initially denied the ship permission to head to Malta and told him to head to Libya instead. Maltese soldiers stormed the El Hiblu 1 early on Wednesday morning as it approached Maltese waters. The captain reportedly told the AFM that a group of migrants he had rescued had taken control of the ship. Speaking to NGO Lifeline, whose ship is docked close to the El Hiblu 1, the captain on Friday described a panic-stricken group of 100 rescued individuals who realised they were heading to Libya. The migrants said they would "break all the ship" if the captain went on with his course to Tripoli. Associated Press on Friday reported that the rescued migrants had threatened the captain and his crew "using metal workshop tools". The captain said that he contacted Maltese authorities only to be informed he did not have permission to proceed to Malta. He alleged that the AFM control centre prefaced its denial with a reference to his ethnicity. "You're Arabic," he claimed local authorities told him. "You cannot proceed to Malta". He said he replied, "I can’t do it. The ship [is] under pirates." "Also, we were six members of the crew. They were 98," the Turkish man told Lifeline. In his conversation with Lifeline, the captain initially said he did not have enough provision to head back to Tripoli. He later said the ship has enough food for one week. The El Hiblu 1 docked in Senglea Thursday morning. A pregnant woman and 47 people "claiming to be minors" were among the people on board. 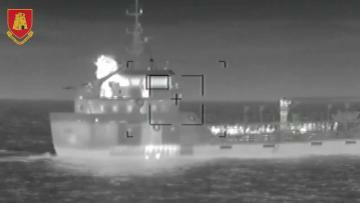 Five men were arrested upon disembarkation in relation to the suspected ship hijack. A spokeswoman for the Office of the Prime Minister said the people aboard the ship included people from Nigeria, Burkina Faso and Senegal. The youngest migrant on board the ship is six months old, she said.